Hatebreed is continuing the anniversary party with a Spring 2018 leg of dates, featuring support from Crowbar, The Acacia Strain, and Twitching Tongues. "We had so many great times on the first leg of the tour that we decided to add another batch of dates with some more of our favorite bands to play with! 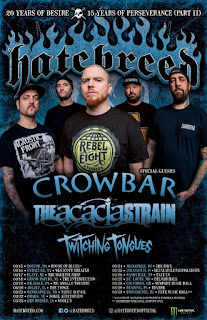 See you soon!," said frontman Jamey Jasta.